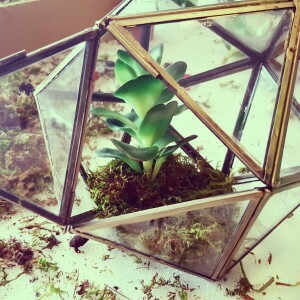 This week at the Creative Concepts NYC studio, our Creative Director Benjamin created mini terrariums. We were enlisted by one of our favorite clients to create arrangements for a “Grow” themed event. 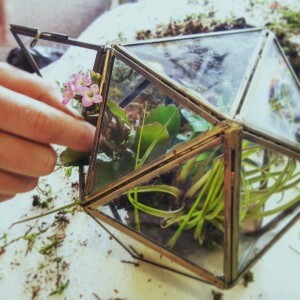 Terrariums are a beautiful representation of nature’s ability to evolve. They can also be completely self-sustainable. 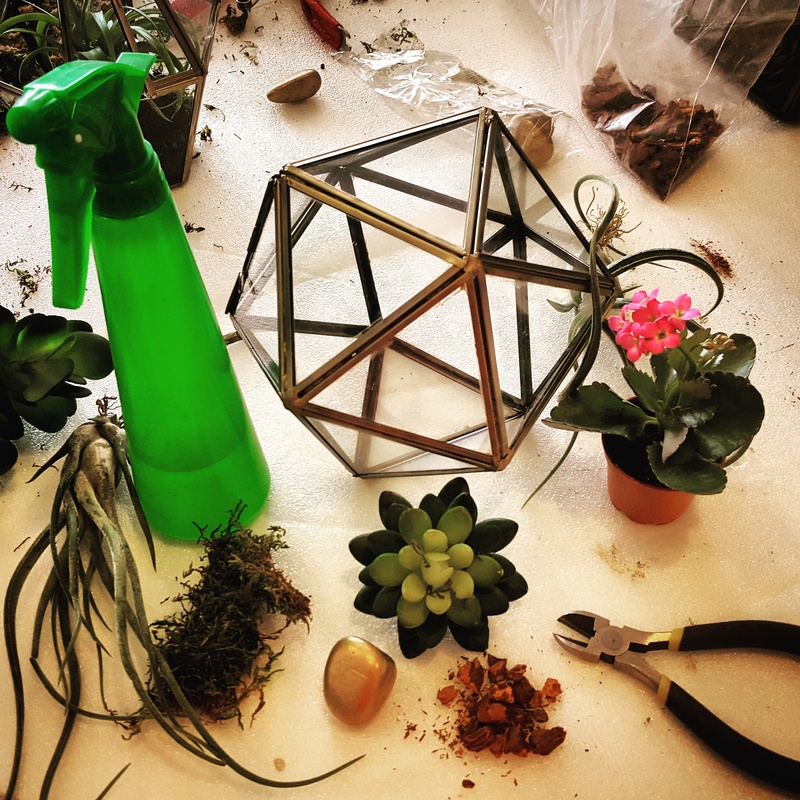 On first glance, creating terrariums can seem difficult, but Benjamin is making very simple ones that right up the DIY alley! Helpful Hint: Make sure your hands are clean! When you are touching the glass it can get very smudgy, your clean up at the end will be a lot easier with clean hands. After cleaning your terrarium, add in your Moss or Grasses to the base of the terrarium. Be sure to mist your moss thoroughly with water before placing in the terrarium, this will make the moss more playable and prevent it from drying out quickly once the other items are on top . 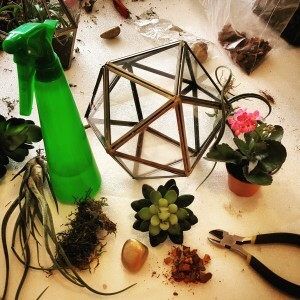 Before placing the other items inside, try to decide how you want your terrarium to look. Most commonly, the starter plant, in this case th e Orchid, is built around mound. When you begin placing the succulents, rocks, and other items inside the terrarium, they should support the starter plant. This creates visual dynamics that will add depth and contrast to your terrarium. Helpful Hint: Less is more! You don’t want to overcrowd your terrarium. 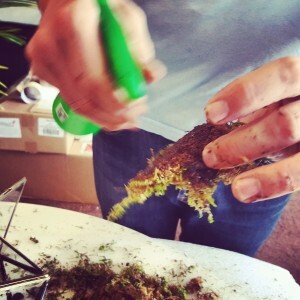 Start by embedding the succulents into the moss on a little mound. Keep clear of the area in the middle for the Orchids. Add your Orchids by leaning it into the mound of the succulent, and support it with the rocks and decorative items. Orchids are air plants, so they do not need to be actually planted in the bed. It will support to stand though, which is where the moss or grass, rocks, and other items come in to play. 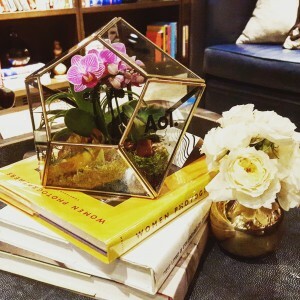 Terrariums are charming and simple arrangements. They are perfect for a unique centerpiece or an unconventional gift. Add them to your list of DIY musts! 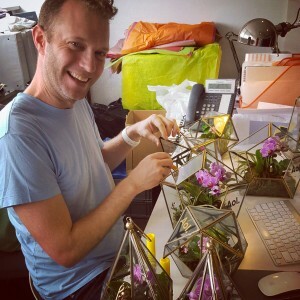 As the terrariums Benjamin is making are for a specific event, these terrariums are not made to last a long time. These require more maintenance to survive. But the maintenance is very easy! 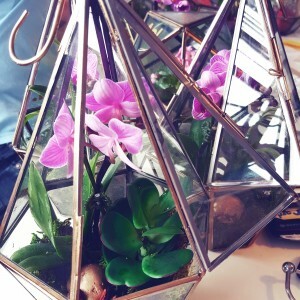 The door to the terrarium needs to stay open because the Orchids need air to survive. Also, you will need to spray the terrarium lightly once a week. These are sealed when completed so that the water is retained and is self-sustainable. For this you would use a different starter plant as Orchids need air to survive. This entry was posted in DIY with CCNYC, Uncategorized and tagged 1ccnyc, Bark, benjamin lester, CCNYC, Center Pieces, Clean, Clover, crafty, creativeconcepts nyc, decor, diy, event, floral, Flowers, Gifts, Moss, new york, New York caterer, Orchards, Rocks, Starter Plants, Succulents, Terrarium, Terrariums, top of the garden, Unique, Violets, Wedding Gifts by ccnyc10168. Bookmark the permalink.